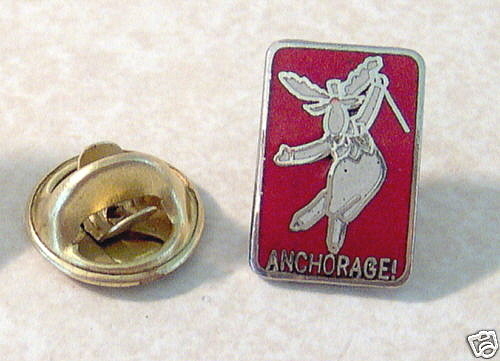 Hi, and Welcome to my Listing, This is a Anchorage Alaska Convention Visitors Bureau Moose Pin. Came from a estate sale that had a lot of collectible pins and patches. Back marked, ANCHORAGE ALASKA CONVENTION VISITORS BUREAU . Measures 7/16" wide and 5/8" tall. Condition Real Good, No defects other than some light scratches and a few small dimples in the white color as the photo shows. Please check out My other Listings, I also have other Vintage Pins listed unless they have already sold, and I will be happy to combine them for savings on shipping costs. If You choose to purchase, Please do with Confidence, I have a Return Policy that I will Honor also My Feedback I receive is Important to me and Grades me as a seller, but More Important to me is having a Happy Satisfied Customer. Email me for any other questions on item description I will be happy to answer them. US SHIPPING DETAILS Buyer to pay Shipping and I will due my best to keep it as low as possible, and you will also get a Delivery Confirmation / Tracking Number, No extra cost for shipping to Alaska and Hawaii. Item will be Packed with Care and Shipped in a Small Box inside a New Padded envelope USPS First Class Mail at cost to the Buyer of 2.95. Shipping insurance is optional. Handling Time: Item will be shipped 1 to 2 business days after payment is received and you will receive a email when payment is received and when item is shipped. I will Also ship Out of the US, If You are Interested in Purchasing and are Outside the US, Please Email me for Your Cost and Services Available, PayPal Payment Required for anything out of US, Thank You. I will be happy to combine shipping of multiple Items or you can email me for shipping cost on multiple items. PAYMENT DETAILS I accept PAYPAL MONEY ORDER CASHIER CHECK PERSONAL CHECK, the item will be shipped as soon as the personal check clears through my bank. RETURN POLICY I will accept returns within 7 days of delivery if there is a major problem with my description or the item you receive. Please email me for any questions on my items to avoid any returns and I will be as honest and as accurate as I can on this end. I will work with you to make sure you are happy with the item you receive.